Makes managing sanitized bottles for a whole batch easy, and lets you get the bottling mess out of the kitchen--no more using the dishwasher rack to hold sanitized bottles. Made by Ferrari Group in Italy. The Rotating Bottle Tree holds 45 bottles. It will simplify the bottling process. Just rinse the bottles out well after use and store upside down on the bottle tree where they remain clean. When you want to bottle, utilize product B520 (seen below) to inject sanitizing solution, such as Star San or SaniClean, into the bottles to sanitize. Wait 1 minute and bottle. You can also do the sanitizing ahead of time and let the bottles air dry upside down. My friend has one and likes it a lot. Have more bottles that need drying. will this also work for wine bottles? I think so, it works great on 22oz beer bottles! Knocking off 1 star because 45 seats isn't enough if you yield a full 5 gallons, and the add-on ring is relatively expensive. I do recommend the rotating version, especially if you bottle by yourself without a helper. Makes the job of cleaning bottles a little easier. No-one likes cleaning bottles, but this makes it go faster & speeds up the bottling process - especially if you get the spray-sanitizing accessory that fits on top. Together they are definitely worth the price. 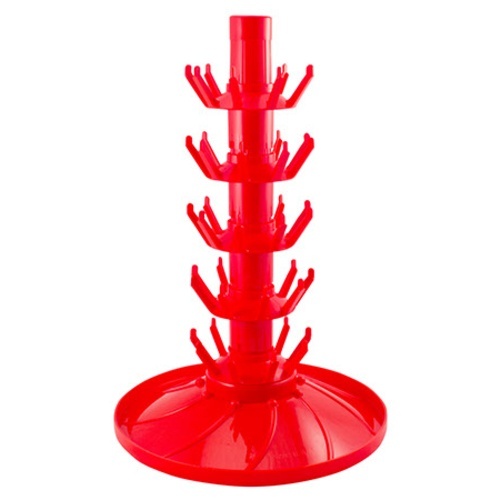 If ever you need a red molded plastic tower to hold you beer bottles upside down at an approximate 45 degree angle, this is definitely the product you’ve been looking for. Excellent for drip drying after sanitation especially with the sanitizer injector attachment. Growlers don’t fair well, but bottles of varying sizes work great. Also good for hanging hoses, airlocks, scissors, carboy caps for drying as well. Really cuts down on bottling time. Don't forget the injector! Highly recommended. I thought I could get away without having one by putting my bottles to dry in the dishwasher upside down (just to dry, not washing them).....i was wrong. This tree saved my marriage! This has made my bottling life much easier. I can't believe I tried to bottle beer without this at one point. Good product for price. Quickly dries the bottles after cleaning, be sure to sanitize it before you place your clean bottles on it! Great for storing and drying bottles. You must add the washer top for this, its worth every penny. It is item B520. Makes bottling day a breeze! If you bottle your beer, I don't know how you'd get by without this. I've seen other racks (square) that are way more expensive. I bought an extra ring for more bottles. Did not give it 5 stars because 22 oz. bottles knock against each other if you use every peg. Also, water/sanitizer can dry at the bottle opening leaving a residue mark purely cosmetic and does not affect the seal or flavor. My second bottle tree and I love it better than the first, has the capability for bottle injector. I wish they could have fit 3 more so it could hold a full 2 cases of bottle ;) Just kidding, this is a very useful addition to you bottling day. And you can always add more rings if you want to. It's nice and sturdy and hold bottles securely while you bottle. If you bottle this rack is a must have. Some beers just call for bottle conditioning and having a rack like this makes the whole process so much easier when sanitizing. I love my bottle tree. I have a double height one with 10 rows (90 bottles) and the sanitized injector on top. It holds all my bottle sizes easily, and is sturdy even when loaded up. I have had both the stationary and spinning, and the spinning is a nice feature to get to all the bottles more easily. I would highly recommend, and don't be afraid to add more rows as it can easily support more. This product saves a considerable amount of time when washing bottles. Genius, and fits on our counter top! We live in a tiny apartment. This tree fits on our counter, doesn't take up much space, and is sturdy (even with the cats jumping around it to get to the window). Has never fallen down, and easy to clean. love this easy to use and keeps the bottles clean and easy to use when filling to just grab right off and fill. You can just wash your bottles and let them dry out using this baby... You do need to purchase the sanitizer injector thou. Both are great. The bottling tree works great! The first few batches I made I didn't have my bottling tree and had to deal with a bunch of bottles that had a lot of residual sanitizer. With the bottling tree, your bottles are drained, stay upside down so no worries for any dust/bacteria settling in the necks, and it's convenient. I definitely suggest the sanitizer injector as well to fit on top of the bottling tree. I had, and still have, a stationary bottle tree similar to this design that I have used for quite some time. I was wanting a tree that would rotate and make sanitizing a little easier. This tree has worked great for me and I would recommend it over the stationary tree.